the momofuku cornflake chocolate chip marshmallow cookie. I hope everyone had a lovely holiday stuffing themselves to the brim with an obscene amount of food and sweets. I know everyone is borderline sick of cookies, and I won’t bother you with a fancy holiday one, but this one came from one of my christmas presents. It’s one last cookie for the year, and I sort of just really had to try it. Just, you know, before those pesky New Years’ resolutions kick in. And because yoga pants really have a way of masking the several pounds we’ve all gained this holiday season (especially the ones with the foldover top). But we’ll all have to put on real pants soon enough, and you want to get this cookie out of the way prior to that happening. So. We had to make something out of it, right away. Before someone died of excitement. The sneaky thing with this book is you really can’t make one thing. Since Christina Tosi uses basic recipes as building blocks to form other recipes, you generally have to make/bake a batch of one of the ingredients in order to do the recipe you’re wanting. By the way, this is completely fine by me considering that, as far as i can tell, I’m going to love every single thing out of this book. So, on deck first? 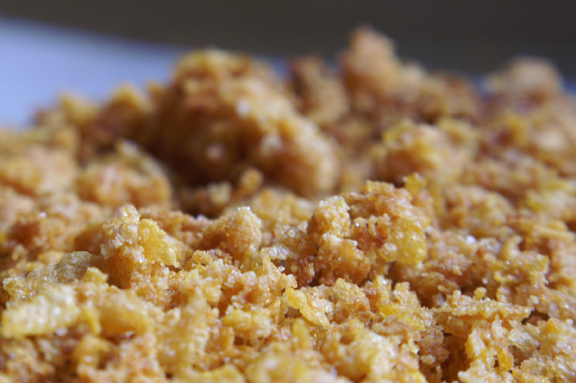 Cornflake Crunch. as pictured above. And wow is it just delicious on its own. We’re lucky we had enough left for the cookies. And super simple, so no need to worry. On to the cookies. And honestly, it’s mostly just like making a regular cookie recipe, no extra trouble or special things to worry about. I like her attitude regarding flour and not having to sift it. I never sift flour, except in cake recipes where I’m too chicken to not sift. Otherwise, I’m a spoon-in-and-level-out sort of girl. Also, I liked her creaming technique: you’ll see in the recipe that although it’s more time, it’s absolutely no more work for you. It actually gives you a nice break to prep the rest of the ingredients. Now: here’s where my train went a little off the tracks, and I’m going to ask for your assistance on this one. Everything went fabulous until the baking part of things. As you can see, my cookies were less than, shall we say, photogenic. Delicious and packed with crazy flavor? Yes. Yes yes yes. Kinda ugly? Also, yes. So I made the cookies a project and experimented with baking times and temperatures, as you can see from figures 1-4 below. figure 1: oven at 375˚F for 16 minutes. crispy and tasted very good, almost toffee-like. But hey; not that cute and where are those marshmallows? figure 2: oven at 375˚F for 14 minutes. better. less toffee-like and a little softer. I tasted the chocolate and the cornflake more. Some marshmallows escaped complete annihilation. figure 3: oven at 350˚F for 14 minutes. getting there! Less toffee ooze, even softer, and definitely more cookie-shaped. figure 4: oven at 350˚F for 12 minutes. SUCCESS!!! This one is what I think it should look and taste like. Soft but with a satisfying crunch, more cornflake and less toffee taste, and the flavors really worked together. like in a miraculous, almost otherworldly way. Now I get it. This is the first time I’ve just blatantly asked for input (although I welcome it anytime) but please; if you make these cookies, will you let me know how they come out for you? I don’t typically have to alter cooking times this much on anything, so I’d love to hear how others fare with this particular recipe. That said, I loved my results. Even more, I loved the challenge. So much that I may make this entire book, just to see if I can do it. It’s a sick character flaw, I know, but I embrace it. I’ll be working more on these and trying to figure out how to make them better. In the meantime, here you go: enjoy. One thing: I like to get the crunch in the oven, and then prep my ingredients (measuring and so forth) for the cookie. Once the crunch is done, it’ll need to cool, so I like to start actually making the cookies at that point. By the time you get to the crunch addition, it should be ready to go. Both recipes adapted from the Momofuku Milk Bar Cookbook by Christina Tosi. My new baking idol. First things first: Crunch time. Pour the cornflakes in a medium bowl and crush them with your hands to one-quarter of their original size. Add the milk powder, sugar and salt and toss to mix. Add the butter and toss well to coat. The mixture should form small clusters. Spread the clusters on to a parchment lined sheet pan and bake for 20 minutes, until toasted and buttery-smelling. and delicious. 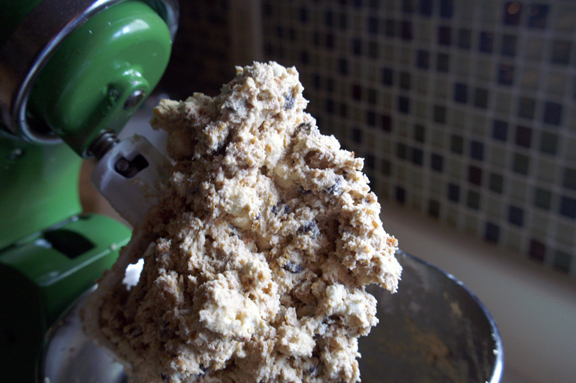 Cool the crunch mixture completely before adding to your cookie mixture. It cools pretty fast, so while you’re waiting on this to finish cooling, begin assembling your cookies. Now for the cookie dough. Line a sheet pan which will fit comfortably in your refrigerator with parchment paper. Combine butter and sugars in the bowl of a stand mixer fitted with the paddle attachment and cream together on medium-high for 3 minutes. Scrape down the sides of the bowl, add the egg and vanilla, and beat on high for 7-8 minutes. I mean it. Still on low speed, mix in the cornflake crunch and chocolate chips just until incorporated, no more than 30 seconds or so. Add the marshmallows and mix again on low just until incorporated, about 30 seconds. If you feel like it’s uneven, use a spatula or large spoon and sort of fold them in the rest of the way. Using an ice cream scoop equal to 1/3 cup measure (thereabouts) portion out the dough onto your prepared sheet pan. Push the tops of the cookies a little flat; not all the way smooshed but just so they’re less roundy and more flat on top. Wrap entire sheet in plastic wrap and refrigerate for at least one hour (I say at least two hours) or up to one week. Finally! We bake the cookies. When you’re ready, preheat oven to 350˚F. Arrange the chilled dough a minimum of 4 inches apart on a parchment-lined sheet pan. Don’t ignore this instruction: it will mean you have to do several batches in and out of the oven, but it won’t work putting them closer together. I use half-sheet pans, and I did six per pan. Bake for 10-12 minutes, watching carefully after the 10-minute mark. When done, the cookies should be golden but not all disfigured like my figures 1 and 2. Cool the cookies completely (they’re very breaky when still warm) on the sheet pans before transferring to a plate or container for storage. At room temperature, they should keep for 5 days. Freezer? One month. I received this book for Christmas too, and I can’t wait to bake from it. These cookies sound fantastic. Can’t wait to try them. It’s so much fun to bake from, Lisa (and i’m sorry i’m just seeing this comment now! Holidays..sheesh): i wish you the best of luck with it! Have fun with it, most of all: I’ve always felt like with each genre of thing in there (cookies, cakes, etc) it’s about getting the hang of the techniques and then it’s smooth sailing from there on out. I’d love to hear how you do! I had trouble baking these as well, my first batch was good, but flat & tough to eat. I followed your advice and baked them at 350 for 12 minutes, and it’s a world of difference! These cookies are amazing. Alley, i’m thrilled to hear it! It took me several attempts to get these to finally work (they’re easily the hardest cookies in the book to get right), and i’m happy that you took the time to do it and that it paid off! Congrats! hi elizabeth! so happy to hear i have a momofuku doppelganger (savory side) out there! i want to make everything in this book (and i mean EVERYTHING), but i need to source a few things first. i’m new to foodbuzz, and it’s nice to meet people who share my addiction to food. 🙂 added you to my wordpress blogs i follow. I just made these and took your suggestion to bake at 350. I ended up baking for 14-15 minutes…but this is because I put the dough in the freezer rather than the fridge. The cookies turned out wonderfully!!! that’s great! i’m so happy your cookies turned out! It took a few tries to get it right, but it’s all worth it when i hear things go well for others. Thanks for letting me know! 1. After prepping the dough, shaped dough into cookies and placed in the fridge for 1.5 hours and after baking, they looked like your Figure 1. 2. Cookie dough in the fridge overnight and then shaped and baked, they looked like your Figure 2. 3. Cookie dough in the fridge overnight, shaped the dough into cookies and then placed in freezer for 1 hour and then baked, they looked like your Figure 3. I baked all the cookies at 350F for 10-12 min. I’m waiting for this lastest batch (#3) to cool before I taste them but so far, the cookies are very crunchy and definitely doesn’t look like your Figure 4. I’m wondering if there’s anything else I can try so they are a more of a round cookie shape and not flat? Any suggestions would be welcomed. 2. The heat from your hands may loosen the dough just enough on these touchy little things to make your #2 be an issue if you’re shaping and then baking. Try a combo of your #2 and #3: shape your dough into balls, refrigerate overnight, then take only the ones you need out and bake them, leaving the others in the fridge until they’re ready for the oven. I think the freezer for an hour is a great idea; the only drawback you may be experiencing is that the outside is firming up much faster than the inside of the ball, which could lead to cookie spread. 3. are you baking them on parchment paper? in my experience, that always helps with cookie spread, so if you’re not, make sure you line your pans. 4. remember: everyone’s oven is different, so if your oven cooks hotter than mine, you may only need them in there for 9 minutes. when i was experimenting with this, i stood in front of my oven window and could see what a difference even a half-minute made with these. what’s great is that you don’t sound discouraged at all, and i’m so happy to hear that! Love that you’re taking the time to see what works best for you. let me know how these turn out! and i hope my suggestions helped. good luck! So glad everyone has posted their experience with making these cookies. I, too, received the book for Xmas and will be making the cornflake, etc., and compost cookies this weekend for a big bake sale. 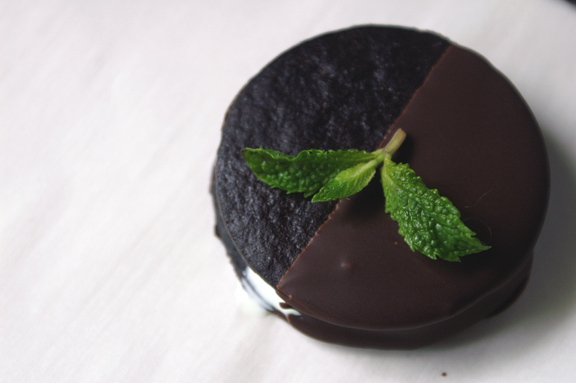 Has anyone tried the chocolate chocolate cookies in the book? I followed your suggestion to switch to 350 and took them out around 12 minutes. I bought a thermometer for my over last week though and was very surprised to see the fluctuations. Oh, Jackie, that’s great! I love hearing how recipes turn out…like, really love it. Aren’t they totally worth it? I’m sure you’ll love the cookbook; i’ve had a great time with it, and i’ve found so far that once you get one of these cookies exactly how you want it, the other ones should work the same way. oven temps are so all over the place…believe me, i’ve had some rough going cooking in other people’s ovens versus my own. Just opening your oven to peek can really change the temp, too. It’s amazing; i never knew how much it could fluctuate either. I think mine (depending on marshmallow/chocolate/cornflake placement) had that caramel-y edge to them too, it’s unavoidable, but adds a delicious little surprise crunch here and there. It reminded me of toffee a little? I agree; it’s a nice complement to the rest of the cookie. you’re so welcome! let me know how the baking goes once you get the book! Why am I bumping your old post? Because I just received my Momofuku Milk Bar cookbook yesterday. That is all. i’ll need a list sent to me outlining your plan of attack for aforementioned cookbook. what you’re starting with, where you’ll go from there, et cetera. ET. CETERA. i’ll expect it on my desk in the morning. BECAUSE I. AM. SO. EXCITED. we should co-bake something! I am SO excited. I ordered the book after trying an adaptation of the cinnamon bun pie. (I used the easy recipe on Averie Cooks, in case you were wondering) It was SO insanely good, that I bought the book that night and had it overnighted. Yes, I said overnighted. So, now that I’ve had the “faux” cinnamon bun pie, I feel like I need the real thing. But, to eeeeease myself in, I’m thinking a possible try-out of the blueberry and cream cookies, pg. 80…for reference. Because I am SO intimidated. LOL! I would absolutely LOVE to co-bake something! E-mail me! Also, I saw on FB that you found corn something or other at the whole foods. I’m jealous that you can find ingredients like that. I will have to plan my baking around recipes that have accessible ingredients…or that I can hunt down on the internet. Ohhhhh, the sorrows of living in the middle of nowhere. LOL! And finally, I’ve been DREAMING of your fruity pebble cookies, which I have yet to make. Once all of the dots connected and I realized you’ve been working through this cookbook, I was all, “Dude! I’m in!” And I am SO in. i am so excited too! i’m emailing you about a) momofuku intimidation factor, b) co-baking something, and c) momo baking supply sources (freeze dried corn, etc). I will say the blueberries and cream cookies are a good first-test-run choice; both those and the corn cookies were the easiest to deal with in terms of being persnickety. But, since you don’t have quick access to the freeze dried corn, blueberries and cream is an awesome choice. the hardest so far were probably (of course) the first ones i tried, the cornflake marshmallow ones. I did research today. Did you know Amazon sells freeze-dried corn? They do! And I’m an Amazon Prime member, which means I can buy all of the freeze-dried corn I want and not pay shipping. Score. I feel like my culinary world has just opened up. As I poured over the cookbook once again last night, I did think that *maybe* the pretzel ice cream pie and the compost cookies sound amazing. Okay, I have to go. I need to order freeze-dried corn. I’m so, so glad I found your post! I’ve been trying to bake these cookies for over an hour, and after failing twice, I headed online to see if anyone else had major problems once the cookies went into the oven. Mine are coming out pancake flat (worse than fig. 1) and burned at 15 minutes, and pancake flat and not burned at 10 minutes. I used a domed measuring cup to scoop up the 1/3 cup of dough, but now I am going to lower the temperature again and try rolling the dough into more of a ball shape (as opposed to a dome) and freezing the dough for a few minutes. I’m glad to see that others had similar problems and grateful for the tips! caroline, i’m just now seeing this this morning; how did your cookies turn out? I hope some of the tips worked for you and you ended up with big, fat cookies last night. 🙂 the good news is if you get these ones figured out, any of other momofuku cookies should be easy because it’s all the same basic technique/times/temps. best of luck to you! Thank you so much for sharing your success with this, well, let’s call it “uncooperative” recipe, in my experience. Could you please say if it should be baked in a 350 convection or conventional oven ? When i was testing this recipe, i baked batches in both a conventional and convection oven – i have one of those microwaves that doubles as a small convection oven, so i tried that to see how they would work. I found that the same temp (350˚F) worked in both, but the convection ones may take a minute longer. Both came out well once i got the timing/temps down. So 350 it is. 12 minutes. I’ll try the conventional oven first, and watch the time. Mick, when I obsessively hover over my oven staring at cookies to make sure they come out perfectly/look normal for the blog, i hope it helps people in their baking. It makes me feel good knowing i can assist. You let me know if you need anything else, and good luck with your cookies! yay! these were really very good, and a huge hit at my house. let me know how it goes! judy, i’m so sorry to hear these cookies didn’t work for you; they’re not an easy cookie (in my opinion, the most difficult momofuku cookie i’ve done) and i know they can be troublesome. it took me oven temp and timing changes to finally get what you see on the blog as a finished product, and i wrote it as such (with my failure examples). i know everyone’s ovens cook differently, however, and that the marshmallow/cornflake/chocolate chip combination is tricky. i wish there was a way i could help. 1. I started at 350 degrees for 12 minutes per your recommendation but worked my way down to 300 degrees for 18 minutes. I highly recommend an oven thermometer and great patience. 2. When testing your oven for proper baking time, put just two cookies on the sheet at a time. If something goes wrong, you haven’t lost a bunch of cookies. Though I will say, even the wrecks are delicious! 3. I kept the dough in the fridge until popping it into the oven. 4. I have only two baking sheets, so to cool down one for the next batch, I put it on a potholder on my washing machine, which is in a very cool room, until the current batch came out of the oven. When they came out of the oven, I just slid the parchment with the baked cookies onto a newspaper on my counter; I didn’t think keeping them on the baking sheet till cooled was absolutely necessary. 5. It might be my imagination, but it seemed that the spread was less if I used fresh parchment for each batch. Now on to the Chocolate-Chocolate Cookies! Oh, mary rose, you’re going to beat me to the ONE COOKIE I HAVEN’T MADE YET! Please tell me how they are when you get finished with them; i’d love to hear about it. thank you for adding your tips! it’s always nice for me and for others to read about experiences and what worked, especially with these tricky things. i’ll have to try the 300˚F at 18 minutes to compare spread on them…i almost lowered my temp again, but didn’t, so i’m interested. so true about doing the test batch, and i also kept mine in the fridge (and returned the unbaked to the fridge) each time i cooked a batch. it really does make a difference. and i would tend to agree with them needing to be “completely” cooled – i did suggest that too, but mine were probably on the “still warm side, but cooled enough to move and not break” end of things. such a good point about new parchment! i tend to reuse the parchment for a recipe unless absolutely necessary to change it out, but i bet it wasn’t your imagination at all. i would imagine the oil and sugar from the cookies could cause extra spreading, especially as you get on in the batch. i’ll have to try that out too next time i make these. I forgot to mention that whenever I rave about Momofuku cookies, I refer the listener to your blog. Frankly, I don’t know how anyone could get through the cornflake-chocolate-chip-marshmallow-cookie baking process without your instructions! I wish I had a commission for all the cookbooks I must have gotten people to buy by now. It really is a fun book! I’m trying the Confetti Cookies next . . .
oh my goodness, thank you so much! i’m so flattered you like my Momo-how-to’s. 🙂 I still can’t believe my first cookie from the Milk Bar book was the cornflake/marshmallow/chocolate chip one; leave it to me to pick the hardest on accident. And every time i hear that this or one of the other posts helped someone be less frustrated, or got them the results they wanted, it makes me so happy. i’m so excited about the chocolate/chocolates! i’m happy you agree; it’s almost relaxing, right? I like the stages of them…mix, chill. make whenever. and by the time you’re popping them in the oven, it’s like you didn’t even make them to begin with. 🙂 and i’ve never done any recipes from the Mrs. Fields cookbook, but i’m going to have to research Sweetie Pies- they sound too good to pass up! oh, the confetti cookies are really delicious; one of my favorites. in a few weeks, i’m making my sister the cake version of those cookies from the cookbook. needless to say, she’s very excited. i personally like the confetti cookies a bit (just a tiny bit) underdone, so let me know how yours turn out and how you like them. Thank you for this! I tried 350 for 10-12 and ended up going for 14 because it was still doughy. The cookies ended up spreading a LOT and tasted very toffee like. So I let it sit longer in the fridge and just tried 300 at 18 minutes. This is a LOT closer to what I was going for – less marshmallow melt and less toffee taste. It’s not perfect… I’d love less marshmallow melt but I’m taking it for now. 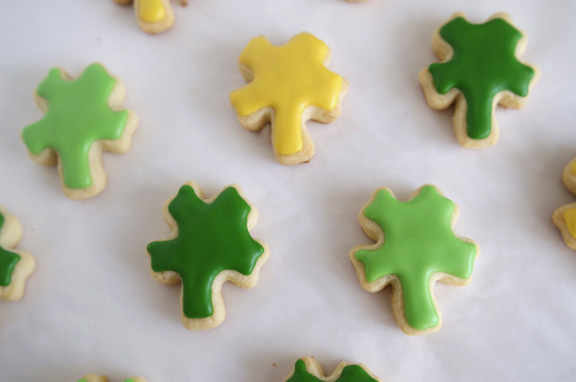 These cookies are definitely not easy but worth the extra effort! stephanie, you are very welcome! i’m happy to be of service. Good work on the cookies – they really aren’t the easiest ones to do, and i’ve found every batch to be it’s own little experiment. I love it when readers like you tell me about your experience with them and how you made them work; everyone’s oven is different, so trial and error (and patience) is a requirement. So happy they worked for you! they’re a little tricky, right? toffee-esque is a great way to describe figures 1 and 2; very toffee-flavored, which some people love. and they spread out like CRAZY when the marshmallows get like that. certainly none of those things are deterrents to eating them, so i don’t blame your roommates for their cookie-gobbling. when you try them again, flip down through some of the other comments attached to this post; there’s a few really helpful suggestions as to how some other readers, with great results. When in doubt, lower the temp by 25˚, and keep that dough chilled between batches. Watch like a hawk until they’re exactly right. Eat. 🙂 let me know how your tinkering goes! Well, glad I read this blog before attempting these cookies! Thank you for posting your results! I didn’t get your Fig 4 result no matter what I did, though. After a bunch of time/temp experimenting, the best results I got (kind of like your Fig 3) were at 350 degrees for 7 minutes, after refrigerating the dough 48 hours, refrigerating the dough until just before baking, and using cold fresh baking sheets and parchment paper for each batch, but there was still more marshmallow melt than I wanted, and the cookies were still flatter than I would have liked. (At that point I was out of dough so had to stop experimenting!) They were very chewy though and not crunchy (which was what I wanted), and the people I served them to raved about them. congrats and great work on your cookie experimentation!! and i think if they taste like how you want them and were chewy and gooey, then you don’t even need to worry about experimenting any further: that’s what’s important, right? The marshmallows in this make it tough to bake; just flat-out difficult because they’re unpredictable as to how they’re placed in each cookie, how many there are, etc. if you’re still on the fence about the cookbook, and you haven’t tried any other recipes yet, i really encourage you (if you feel like you like this particular style of baking and the flavor profiles) to try a few more recipes before you put this one on what i like to call “terminal checkout” at the library. You just did what i did and made the most difficult cookie recipe first; i promise you that after doing all of the other ones myself, that’s the truth. The rest are so much easier (no marshmallows to contend with!) and they’re delicious. the cakes (especially the birthday cake) is amazing. i haven’t made all of the recipes, but i felt very challenged and nervous the first time i attempted anything. As i worked, my confidence grew, and now i feel very comfortable with it. so! try another cookie, if you feel so moved. those compost cookies? crazy. and i loved the chocolate ones as well. Thanks so much for your encouragement! Good to know these are the hardest in the book. 🙂 I might try the chocolate ones. These were indeed fabulous-tasting, despite being ugly – on the other hand, I served them to a group of entirely male co-workers, and while I was crabbing on and on about their looks, they were going, “Huh?? Wha? ?” with their mouths and hands jammed full of cookie. Maybe I just have to choose my audience! 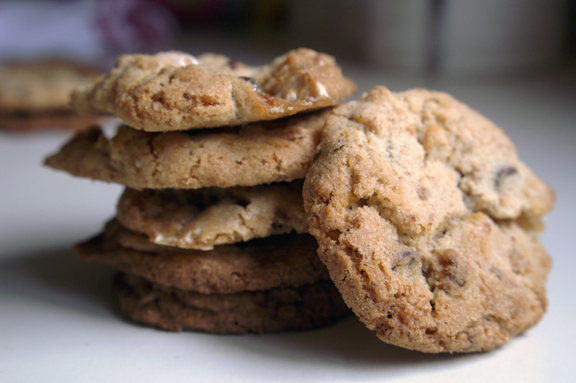 When I made these cookies at my blog, it took a lot of wok to get right. I made them a lot smaller, and found that less is better with baking. I controlled cookies spread a bit by switching to a higher protien flour. smaller is definitely better with these, right? the book has you making them SO big, and with these, i think it makes them impossible. thanks for sharing your experience with them. it just seems like they’re so difficult and touchy, and everyone i know has had some issues. The spread of a cookie is apparently very much tied to the fat content of the butter used (so says Cooks Illustrated, Nov 2011) — the higher fat butter used, the slower the spread and the more dense the cookie, which is ideal in the case of this recipe (but not all cookie recipes). The highest fat percentage available would seem to be about 86%, either Vermont Creamery euro style or Organic Valley euro style, whilst your typical Land O’Lakes is only 82%. I made the mistake of making them with the latter, and haven’t been able to completely fix the spread simply by changing up oven temps and cooking times. Here’s hoping this next higher-fat batch exhibits less of a wicked witch move (“I’m melting!”). I’m crossing my fingers and hoping your next batch turns out exactly the way you want it to! Let me know if that alters them. I have yet to make or try the Crack Pie…but i’ve heard stories of wonderment. I’m almost afraid to make it because i don’t want to give myself a massive sugar high (but certainly i’ll make it at some point this year, because i have to know for myself what it’s like). I totally agree. My husband brought one back for me from NY and I preferred this recipe over the “real” cookie. In addition, yes, the crack pie is good.. but I couldn’t get through a whole slice – too sweet… and I love sweets! Crack Pie is amazing, really. Just plan to share and have a plan for the leftovers. melanie, i love how it’s THAT good that i need to have laid actual plans for getting it as far away from myself as humanly possible. 🙂 Thankfully, i have Mr. Table’s work; they love things like that, and will devour anything i send them. The crack pie will have a final resting place with them. I haven’t tried these cookies nor do I have the cookbook, yet. (Getting close to needing another pantry just for the cookbooks). But they look great and I really enjoyed the comparison! Well done! Recently, I made home made s’mores complete with home made marshmallow. I’ve heard many times that once you make your own (it’s a bit messy but easy), you’ll never want store bought again. I totally agree. Anyway, home made ‘mallows may be a good way to bring these cookies to a newer and higher level. In any event, I’m probably going to try these this weekend. I feel your cookbook pain, Ed: I too am a cookbook collector who is swiftly running out of space for them. Thank you! I hope when you make these that you enjoy them; i’ve had some great feedback so far with these cookies, and i wish you the best of luck. I know they’re not the easiest to make, but I do think they’re worth it. I love your suggestion of using homemade marshmallow for these cookies! I’ve made homemade ones, but never added them to these; i bet it wold be fantastic. you’ve given me something to try the next time i make these (and you’re right; once you make them from scratch it’s difficult to go back to the bland store-bought sort). I made these cookies this past weekend and I wanted to pass along some tips. I searched high and low for high % fat content butter, I made it with the vermont butter, I’m really sure if they made a differnce. I think the next time I make the crunch part I am going to try to decrease the butter by half. For the crunch I used regular land o lakes butter but I found the butter flavor overpowering (and I LOVE butter). I cooked the cookies at 325 for 15 minutes and they came out perfect every time. My husband and I made the mistake of eating them while they were still warm and the cookies were wayyy too buttery, it tasted like a cookie with butter spread on it, so that kind of killed it for me- but just momentarily. I let them cool completly and i found that the butter taste was no longer overpowering but was more faint (did anyone else find that or am I crazy?) I want to try them again soon but decrease the butter in the crunch to 4-5 tablespoons. Also i brought the left overs to work (there were still a couple of rolls in the freezer) everyone at work went NUTS, i’m not joking i have never seen them react like this. People were asking me to make more and commenting how great the cookies were and some were so bummed that they didn’t get to try one- so I made the rest of the batch that was in the freezer and they were all gone in 20 minutes! these were a huge hit! I will post later if tweaking the butter in the crunch makes any difference. Natalie, thank you so much for the feedback and suggestions! I swear this is fast-becoming my favorite post, not because of what i wrote, but due to all the comments from everyone who has attempted these. Butter is SUCH a big factor in these, for sure; they do have a very buttery taste to them right out of the oven, i do remember that. Certainly i’ve noticed varying degrees of difference between recipes like this when i switch out the brand of butter used, because there’s just so much in them. When i get a chance, maybe i’ll use this recipe to experiment with different fat-content butters to see how they differ in my own kitchen and pass along the results. I’d love to hear if you make these again how tweaking the butter in the crunch turns out. I’m happy they were a hit! I only found your blog after I had already made the dough, shaped the balls, and refrigerated them, so unfortunately was only able to benefit from the fruits of your baking trial & error. 13 mins at 350 deg produced a pretty crunchy cookie with a slight chewy undertone. 11 mins gave me a considerably chewier cookie. So, the flavor itself… I’ve had the one from Momofuku’s bakery before and this recipe doesn’t produce ones quite like theirs. I can’t pinpoint what it is, but something’s missing. I’ve also made their banana cake using a recipe I found online and again, something was missing. I have a feeling all these Momofuku recipes aren’t the real deal. While they’re good and yield tasty treats, why would Momofuku leak their secrets? I think they’re holding something back. I always wonder about cookbooks from restaurants, because it does make you wonder if it really IS the actual recipe or if it’s one which is very similar. Certainly some things probably have to be adjusted to work in home ovens versus commercial, but since i’ve never really worked in a kitchen for any length of time, i wouldn’t know the first thing about that part. I’ve never had the real deal, but i’d love to someday try and compare them. Certainly the book has been really fun to experiment with. I hope you have good luck in the future with their recipes! THANK YOU! I made these cookies this morning and I thought my oven had gone berserk. 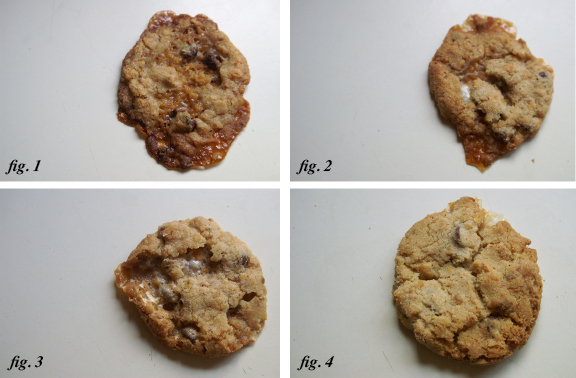 My cookies look exactly like Figure 1 – taste great but I’m supposed to take these to a party later today and will have some explaining to do. I shall persevere and try your revised oven temp and baking time. Erin, you’re welcome! Trust me, your oven did not go berserk; these cookies are a challenge, and i’m happy they taste great (no matter what the look). 🙂 Hope you have better luck with revised recipe! let me know how it goes if you get a chance. I’d love to hear about your results. After baking one cookie and feeling totally deflated that they came out so thin, crispy and very wide, I went on google image search to see if I wasn’t the only one. My cookie looked a lot like your figure 1. Fortunately, I have many more cookies to try and tinker with the temperature and time. Also, mine stuck to my parchment paper (it was a fresh one) and so I lost half of my cookie. Any suggestions? I’m considering buying siplat but don’t know if it’s worth it as parchment paper has worked fine so far for all my baking needs. Hi Shari; i’m sorry to hear about your baking troubles! These cookies are difficult; not to make, but the baking part is the nail-biter, for sure. First thing i’d suggest is lessening the time, and maybe even the temperature by 25 degrees or so, just to see if that helps; sounds like you could do both at the same time without a problem. They do spread out quite a bit, but they should be keeping some volume to them. The marshmallows are the trick here: that’s what melts and crisps into the cookie. As for the stick factor, did you wait until they were completely and totally cool? That’s a big factor in transferring here, same reason: marshmallows. If altering the temp and lowering the time doesn’t help, try freezing them a few hours first and popping them directly into the oven; that’s helped some people. I like to bake with the rack in the middle to middle-low section of my oven, so try that also (if it’s not where your rack is already.) As always, watch these like a hawk; what you’ll see with these is a general heat-up, then the balls will start to spread out, then you’ll see the marshmallows begin to go. Keep an eye on those: they go from white and puffy, to melty like you’d see if you were microwaving marshmallows for cereal treats, and then they start to go caramel. They key is to take them out as they are in melty stage, but still white, because once you remove them from the oven, they’re still going to bake a little bit (indeed, your entire cookie will), which can make all the difference between soft-ish marshmallow and too-spread-out caramel candy bits. Lastly, consider the pan you’re using. Darker pans tend to make things bake faster, as do inexpensive pans, in my experience. I keep some cheap pans around for making chocolate bark, throwing under pies, or making less finicky things, but a good pan will dramatically alter how cookies like this bake. If you have a choice here, choose a light, good-quality pan. Shari, i hope this helps! I’m sorry I didn’t see this sooner; i was away from my computer for a few days. Let me know how they turn out or if you have any more questions. Hi Allison! Sorry for the delayed reply: i took a little time off over the holidays. I’m really hoping the cookies turned out for you and that my tutorial helped! I agree: spending time and money making cookies that burn and look crazy is frustrating, so i hope you had luck with them. No worries. They did not work 🙁 I just think there’s too much butter in these cookies and it really backfired. I think im just going to make the delicious cornflake crunch stuff and add that and marshmallows to a regular chocolate chip cookie recipe. Boo. I’m so sorry to hear that! there’s yes, a ton of butter in these, and the combination of the fat and the marshmallow melting is really a tough one to make work: i agree. I will say that these are the most difficult in the book to make, by a long shot, due to the marshmallow part of things, so if you ever want to try another cookie from the book, you should have an easier time with any of them. Hi there! Just wanted to share my experience in baking these. I got the Momofuku Milk Bar cookbook for Christmas and decided to start with these so I was curious to see how other people did when making them. Came across your blog and thought it so interesting all the different experiences people had. I read a few suggestions that I took into consideration when making mine and I think it paid off! First, I used the mini marshmallows that are typically in hot chocolate mix (kind of like Lucky Charms marshmallows) rather than bagged mini marshmallows. Second, I balled up the dough in the recommended size using my 2 3/4oz scoop. Then I froze the cookie dough balls for 24 hours. I immediately put them on a room temperature baking sheet with fresh parchment paper; baked for 15 minutes at 325. They look great to me! Here is a picture of how mine turned out: http://imgur.com/vBDEUCf You can see some are a bit flatter but not super flat and definitely not burned. They are crunchy on the outside and a smidge chewy. Anyway, just thought I’d share! Hi, Marley! First let me say that your cookies look fabulous: what a great job pre-troubleshooting, and i think you hit all the key problem areas that people tend to have issues with. i love your thought about using the tiny marshmallows, because i imagine they’re more stable in terms of melting (they look like they stayed intact). Freezing them is a nice technique also: i’ve never tried that, but i would imagine that makes a difference and would help their spread a little bit. Wonderful job! thanks for sharing your experience: i feel like the more info is out there, the better: it seems to help readers with the cookies (and they’re so good that i just want everyone’s to come out perfectly.) thanks! Thanks Shannon! I just made these cookies today and mine came out like fig 1, way too crispy and flat! Luckily I only baked 1 pan first and then went searching for advice on the recipe…Eureka! I will now bake the rest at 350 for less time! I also stumbled across a couple of sites that increased the amount of flour to lessen the spread. Good to know these are a little tricky! You’re so welcome! thanks for writing: i love to hear how people do with these cookies, and i’m happy to help. These cookies are super tricky! My friend pointed me to your blog entry after my cookies turned out like your Figure 1, baking at 375 degrees for 11 minutes. They spread like crazy. I was so relieved to see that I wasn’t the only one challenged by this cookie. Never one to back down from a confrontational cookie, I worked my way down with the temperature to 350, baking at 12 minutes, which resulted cookies that looked much like Figure 3. I tried them at 325 for 13 minutes and they look much closer to your Figure 4 but there was still spreading. I tried baking them at 300 at 15 minutes to see if there’d be much of a difference in terms of spreading and marshmallow melty-ness and there wasn’t much difference except in color; they spread just the same. In the end, I preferred the ones baked at 325 for 13 minutes but wish the marshmallows wouldn’t melt as much and for the cookie to spread less. The bright side is that they tasted delicious no matter what temperature they baked at, but presentation-wise, the different baking temperatures made a huge difference. I do wonder if using different flour (bread flour like Milk Bar as opposed to AP) and different butter (European versus your normal non-grocery store brand like Land-o-Lakes or Challenge) would change anything, especially with this particular recipe! Thanks for your post and I’m really curious to see if anyone else has any tips! Hi, I wish to confirm something in the Cornflake portion of the recipe. I made this according to your site, with 3 Tablespoons of brown sugar. However I am noticing on other sites (MarthaStewart, and WeeEats) they are listing that ingredient as 3 Tablespoons of Sugar (white). Since you mentioned that you have the Momofuku book, I was wondering if you could take a look and confirm which it is supposed to be? Yes: the book actually lists it as white sugar, but this recipe (as I mention up top) is adapted from the original. I tested this several times in my own kitchen, adjusting – among other things – some of the ingredients along the way. I liked how the brown sugar-coated cornflakes came out slightly better than the white sugar ones, but you do what you prefer! That’s the fun of recipes like this, I think. thank you for writing! Thanks for your quick response Shannon! I used brown sugar the last 2 times I made them as well, I only just noticed that the other copies of the recipe I found online yesterday called for white sugar and I thought I’d been making them wrong all this time. I might try them once with white sugar just to see the difference, but I’ve been happy with the brown sugar up until now so I don’t think that it makes much difference. depending on your scoop size (and how much you fill your scoop, i suppose) you’re looking at somewhere between 20 and 24 pretty large cookies. buche de noel 2011: happy holidays!